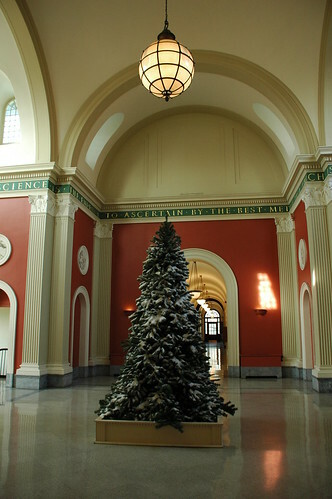 The center hall of BBG's landmarked Lab and Admin Building, decorated for the winter season in December 2007. 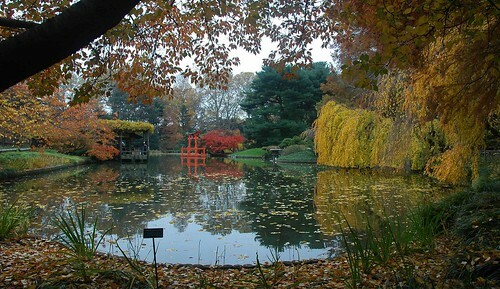 Admission to the Brooklyn Botanic Garden is free Tuesday through Friday (the grounds are closed closed Mondays, though offices are open) all Winter, from November 20 through February 29. 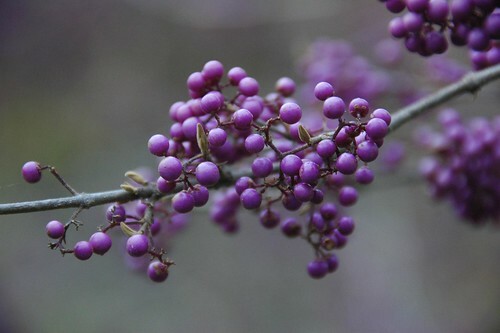 Both the Native Flora Garden and Cranford Rose Garden are closed all Winter, but there's still stuff happening to see. 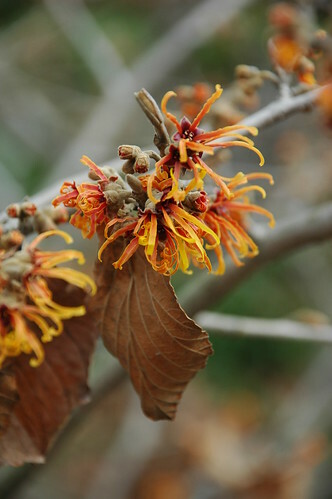 Come January, the Witchhazels put on their show. 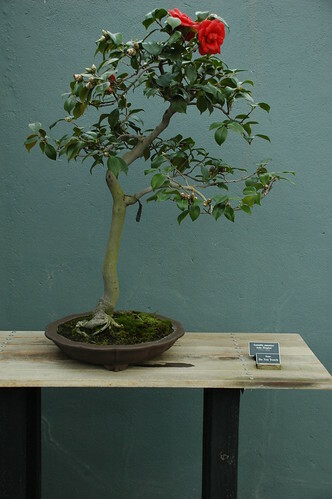 Check out the Bonsai Museum any time. 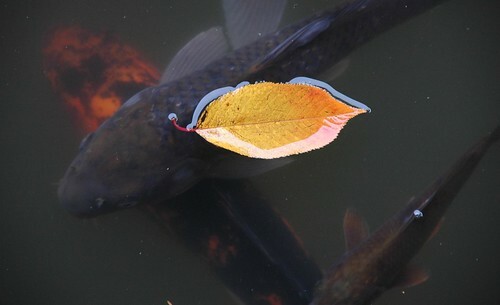 And this is the best time of year to enjoy the Japanese Garden in contemplative solitude. Sunset Park can haz Community Garden? Some Sunset Park residents want to grow stuff...lots of stuff. You know, things like vegetables and flowers and green things. Despite there being several very active members of the Sunset Park Garden Club [which maintains gardens in Sunset Park itself], there is a desire and a need for a more typical community garden with plots and benches and composting. They are meeting this Saturday, November 29, at 10:30 in front of the 9th Avenue subway station (D and M lines) in Sunset Park, just south of Greenwood Cemetery. There are vacant lots on either side of the station building, visible in this Google Maps Street View of the station. For more details, see the original post. 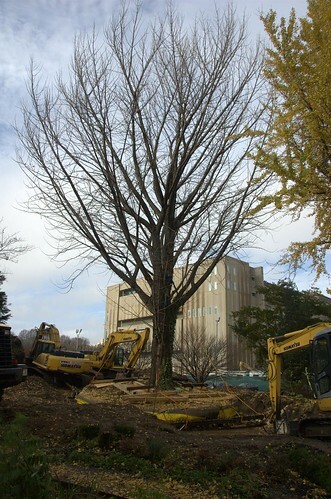 This huge, mature Ginkgo biloba tree is being relocated to make room for construction of the Brooklyn Botanic Garden's new Visitor's Center. The new building will open onto Washington Avenue and the parking lot BBG shares with the Brooklyn Museum, the building in the background in the photo above. The muddy mess in the foreground used to be the Herb Garden, which is being revisioned as a "21st Century potager" which will be located along Flatbush Avenue, south of the rock garden. This shot shows more of the ground, including one of the old paths in the Herb Garden in the foreground. Here's a view from a different perspective, looking back toward the entrance from the parking lot. 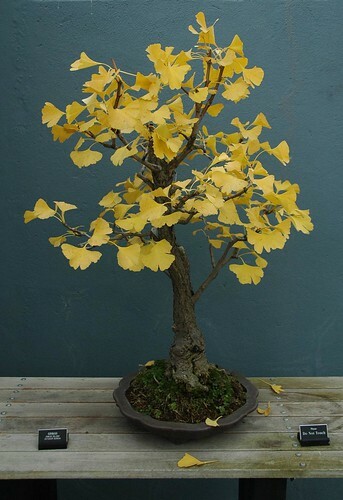 Here you can see the other three Ginkgos which must also be dealt with before construction can begin. 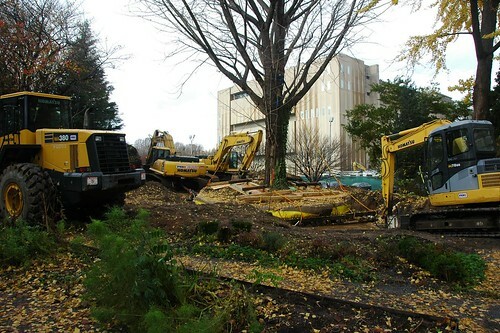 These are going to be converted to lumber and other materials which will be incorporated into the new, green building. It looked like this when I visited with the Brooklyn Blogade back in October. 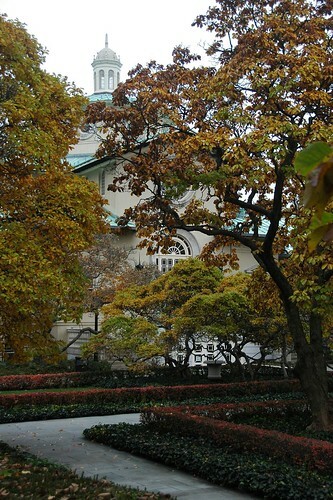 The Ginkgos are leafy and green in the background. Here's a closer view of the gigantic root ball. I first estimated it to be at least 12 feet across. Now I think it's at least 20 feet across. Compare the width of the root ball to the four foot width of the 4x8 sheet of plywood lying on top of it. 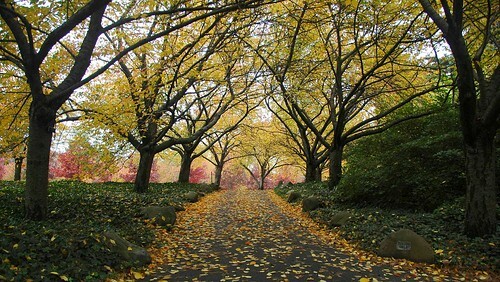 The botanical world - especially New York State, New York City, and Brooklyn - suffered a great loss recently. Steven Earl Clemants, Ph.D., Vice President of the Science Department of the Brooklyn Botanic Garden, died suddenly and unexpectedly on Sunday, November 2, 2008. Funeral services were held last Friday, November 7. He was 54 years old. I never met Steven, but I've known of his work. I've written about some of it on my blog. His contributions in several fields, including native plant conservation, invasive plants, and urban botany, are substantial. I can only summarize. 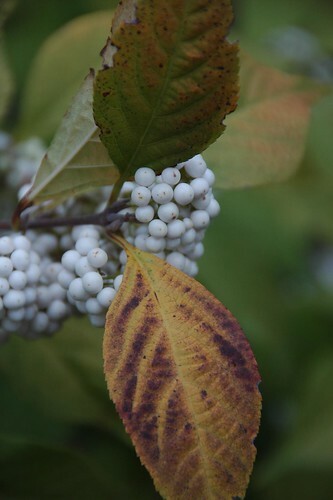 Dr. Clemants was Chair of the Board of the Invasive Plant Council of New York State. He was the Historian and past President for the Torrey Botanical Society, and Chair of the Local Flora Committee of the Long Island Botanical Society. 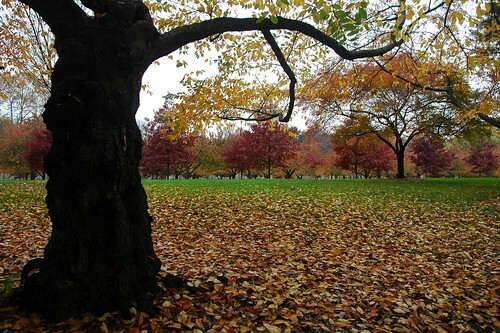 He was a founder, coordinator and contributor for the New York Metropolitan Flora Project (NYMF), which is documenting all the flora within a 50-mile radius of New York City. He was Codirector of the Center for Urban Restoration Ecology (CURE), a collaboration between BBG and Rutgers University. 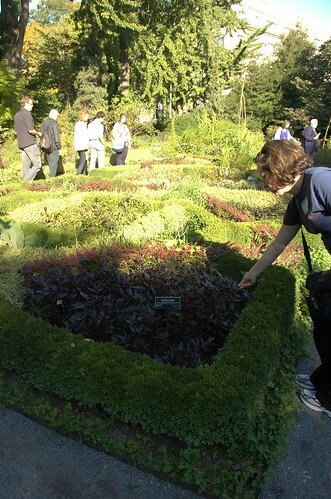 He served on the Advisory Board and Atlas Committee of the New York Flora Association. He was a graduate faculty member of both Rutgers University and the City University of New York. He was also involved with the New York State Invasive Species Task Force, the Prospect Park Woodlands Advisory Board, and the American Institute of Biological Sciences, among many other efforts. He was Editor-in-Chief of Urban Habitats, an open-science online journal dedicated to worldwide urban ecological studies. In addition to authoring and co-authoring numerous technical journals and articles, he was co-author, with Carol Gracie, of "Wildflowers in the Field and Forest: A Field Guide to the Northeastern United States." The Dr. Steven Clemants Wildflower Fund has been established to honor him. Steve's widow, Grace Markman, is working with the Greenbelt Native Plant Center to plan a living memorial that will foster the planting of native wildflower species in New York City parks. As an alternative, here's an Amazon Associates link for the paperback edition of the Field Guide which Dr. Clemants co-authored. I will donate any proceeds I receive through this link to the Dr. Steven Clemants Wildflower Fund. The Field Guide is also available in both hardcover and paperback editions from BBG's online store. This evening I found myself unable to sign in to and leave a comment on my own blog. After struggling with it for over a half-hour, I switched this blog's "Comment Form Placement" to "Full Page" from "Embedded." That seems to have circumvented the commenting problem, but I still can't edit my own blog. If you've tried to leave a comment recently - the past two or three weeks - and were unable to do so, please try again. Others have reported the same problem in the Blogger Help forums, but no one has gotten any relief. 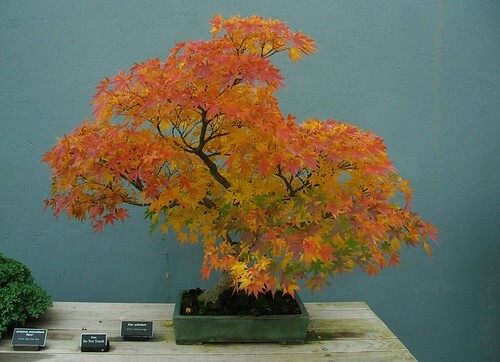 The process to start moving the tree began in the spring, when the garden hired Perfection Tree Experts to make the move. 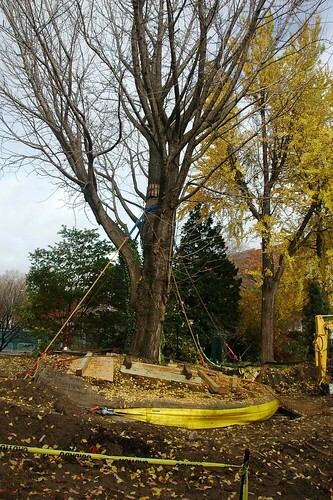 During that time, the company scored a big circle around the tree to prepare its roots. 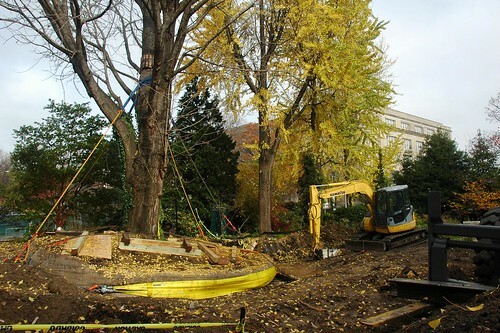 After the pruning was completed in the spring, the tree was given time for its roots to strengthen, and on Monday, Locke started digging around the tree and preparing it for the move, which they are hoping will be complete by the end of this week. Blog Widow and I both grew up in New York state. 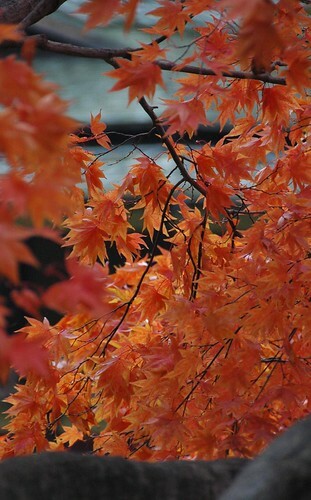 The annual spectacle of fall foliage never fails to leave us in awe. We usually try to make some kind of annual road trip out of the city to enjoy the foliage, but this year our schedules haven't permitted it. 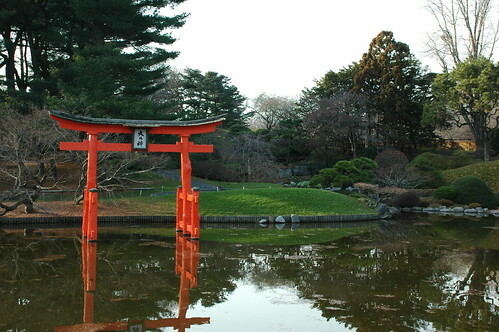 Friday we went to the Brooklyn Botanic Garden. It was my first chance to get there this season. It was psychedelic. It was hard to take a bad photo, but these are some of the best of more than a hundred shots I took during our few hours there. Hope you enjoy them as much as we enjoyed being there. All are best viewed at screen-filling enlargement in a dark room. View toward the Cherry Esplanade from the Cherry Walk. By my best estimate I have now visited 36 of Brooklyn's community gardens, most of these from the three Brooklyn Community Gardeners Coalition (BCGC) Green With Envy (GWE) Tours I attended this year. 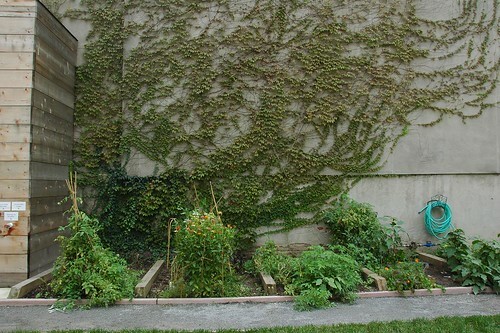 This is just an introduction: there are over 200 community gardens in Brooklyn alone. It's become clear to me that the future of community gardens in Brooklyn, and throughout NYC, is not assured. 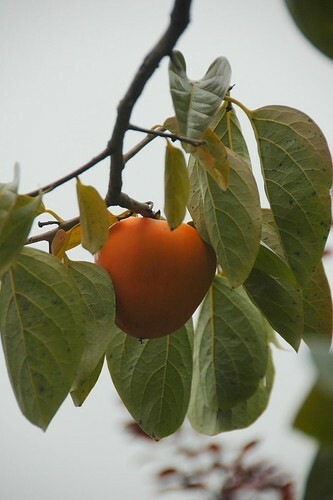 They are facing renewed threats to their survival, to their identity as community gardens. Paradoxically, the systems set in place to protect community gardens may contribute to these threats. Anne Raver's Home & Garden column in the November 6, 2008 New York Times highlights these threats. 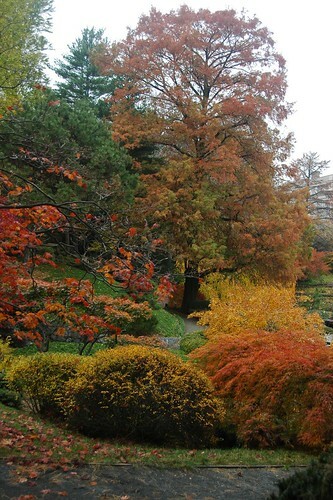 She highlights two gardens - one in Jamaica, Queens, the other in Harlem, Manhattan. Both are owned by the New York Restoration Project. 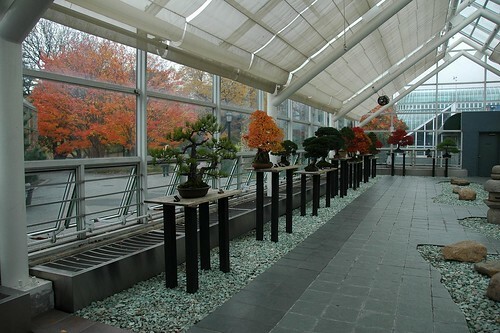 Both were recently overhauled by professional garden designers with hundreds of thousands of dollars of private funding. Walter Hood, a California landscape architect, redesigned a community garden at the corner of Foch Avenue and 165th Street in Jamaica, Queens with $350,000 donated by G-Unity, the private foundation of Curtis Jackson, aka 50 Cent. The garden, once called the Baisley Park Community League Garden, is now known as the Curtis “50 Cent” Jackson Community Garden. $350Gs buys not only water collectors "shaped like martini glasses", but naming rights. Excuse me?! In what way are community-run gardens not "the real thing"? Some of those "temporary spaces" have been in continuous operation as community gardens for four decades. How is it that only the arch touches of a professional designer and corporate sponsorship bestow "realness"? How insulting. For 15 years, this garden has been an important resource in improving the safety and quality of life in this Bedford-Stuyvesant community. A local elementary school and several families are currently involved in the maintenance of the garden. 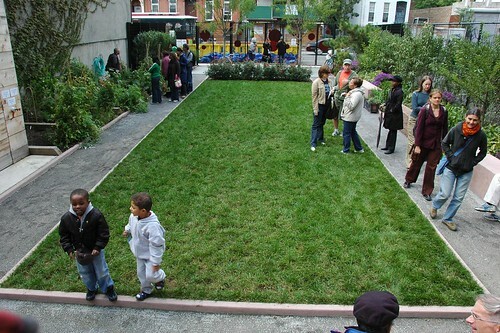 During 2004, these residents raised funds to support the site's use for gatherings, workshops, and as a learning garden by neighborhood school children. Target is generously supporting the restoration of the garden and selected nationally acclaimed garden designer and horticulturist Sean Conway to provide the garden design. Since 1998, Conway has helped to create the garden centers in Target stores and also designed the gardens at the Target corporate headquarters in Minneapolis. He has also been a frequent guest on Martha Stewart Living and is the co-executive producer and host of Cultivating Life on PBS. In some sense, this is still a garden. It has flowering plants, a lawn, places to gather. However, in no way can it be called a community garden. Is it reasonable to still call something a community garden when it has been completely redesigned and rebuilt with $250,000 of corporate sponsorship? Even the garden's designer is corporate, which explains why it feels more like the "Target corporate headquarters in Minneapolis" than a community garden. The few remaining gardening plots have been relegated to the worst possible location: huddled against the north side of an adjacent building to the south of the space, completely shaded except during the morning and evening hours of the the long days of summer. The community was involved in setting priorities for the design. I can accept that they got what they asked for. The community enjoys the rewards this space provides. They have a space which is open all day for the enjoyment of all residents. 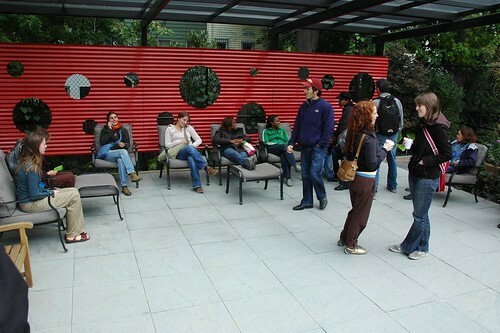 People come and gather and interact. This is a village green, a town square. However, the community is not involved in its upkeep, except in minimal ways. It is no longer effectively "gardened by a group of people." It's open to anyone, even those with no hand in its making. That's a good thing (with apologies to Target's other corporate personality), but that's what makes it a park, and not a garden. 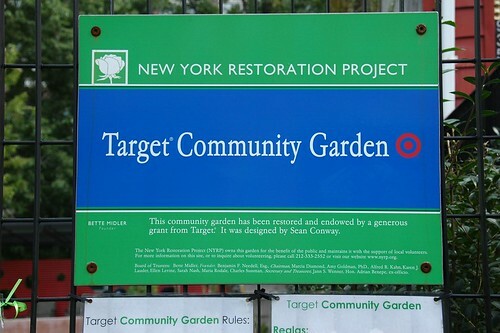 It would be hard to miss the Target East Harlem Community Garden on East 117th Street, just east of First Avenue. The garden, designed by Mr. Conway and completed in early October, greets the visitor with a forest of steel poles sporting bright red disks. All that’s missing from those circles is a bull’s-eye. “That would have been too over the top,” he said in a recent conversation from his home in Tiverton, R.I. Mr. Conway, who stars in a PBS show, “The Cultivated Life,” and designs outdoor furniture for Target, noted that “those circles were a little bit of a nod” to the company, which provided $300,000 to build the garden in a vacant lot. Really? Over the top? This makes at least two corporate parks Mr. Conway has now created for Target out of what once were community gardens. 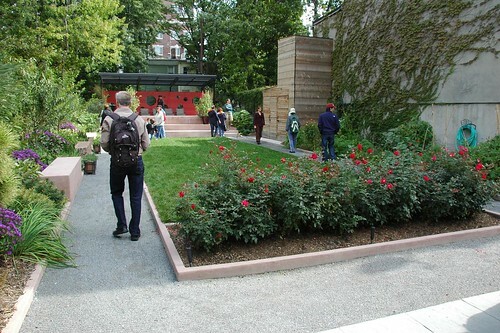 NYRP has already redesigned 30 of its 50 gardens, and has plans to do another dozen, leaving only 8 gardens untouched. If there's any community left when they're done, it will be unrecognizable, hidden behind corporate swag. The pressure to be "open"
There are a handful of other holdings, including those on private property, but most spaces identified as community gardens in Brooklyn are held by one of these three. In the bad old days, then-Mayor Rudolph Giuliani placed many of the city's community gardens on the chopping block, as city-owned "vacant" land to be sold at auction for "development." The Trust for Public Land stepped in and bought many of these properties. Celebrated entertainer Bette Midler founded the nonprofit New York Restoration Project (NYRP) in 1995 in the belief that clean, green neighborhoods are fundamental to the quality of life, and that every community in New York City deserves an oasis of natural beauty. Seeing many parks and open spaces in dire need of cleanup and restoration, Ms. Midler created NYRP to be the "conservancy of forgotten places," particularly in New York City's underserved communities. NYRP quickly raised millions of dollars and bought threatened properties outright, preserving them as gardens. 13 years later, NYRP wields tremendous clout; their 2006 financial statements show over $8million net assets, and over $8M annual revenues. That's a lot of money, and NYRP is under pressure from its sponsors to spend it somewhere, preferably with visible results. This means NYRP is landscaping and redesigning gardens, even when the community is not asking for it. As more and more community gardens receive professional treatment, the communities of those gardens become less involved in their design and upkeep. Target Park is just an extreme example. The garden, the physical place, is taking precedent over the intangible associations of the hearts, minds, sweat and tears of neighbors working together to build community. With less community investment, gardens slide ever more toward becoming parks for passive enjoyment, and away from providing opportunities for people to dig, get their hands dirty, and connect with our birthright to nurture and grow green, living things. WHAT: The Flatbush Daffodil Project was founded in 2007 by Flatbush Gardener and Stacey Bell and this year is co-sponsored by Sustainable Flatbush. We have 1,650 daffodil bulbs and they are going in the ground! Come do some real community gardening with your neighbors, plant daffodil bulbs in tree pits and along the streetscape. WHEN: November 2, 8 and 9. 10AM to 1pm. 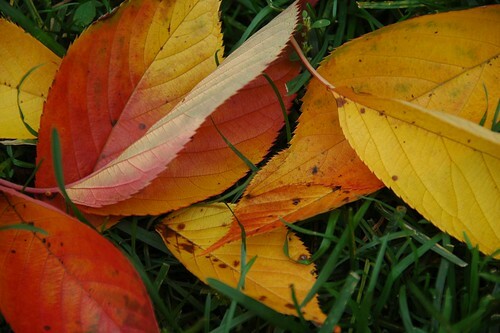 WHY: Plant bulbs in the fall, enjoy the flowers in the spring!